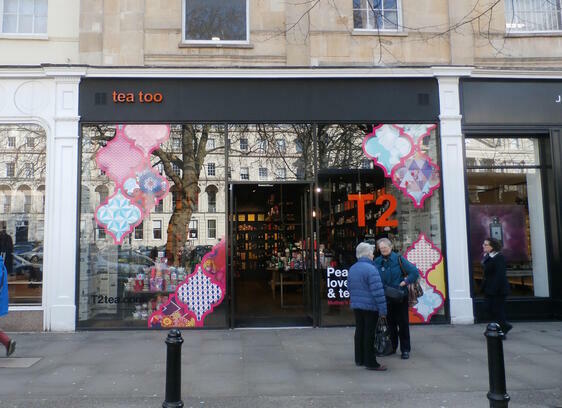 You will have heard of Starbucks and Caffé Nero but you might not have heard of T2 who are an Australian tea brand expanding across the world. They currently have 14 stores across GB and plans to open more. 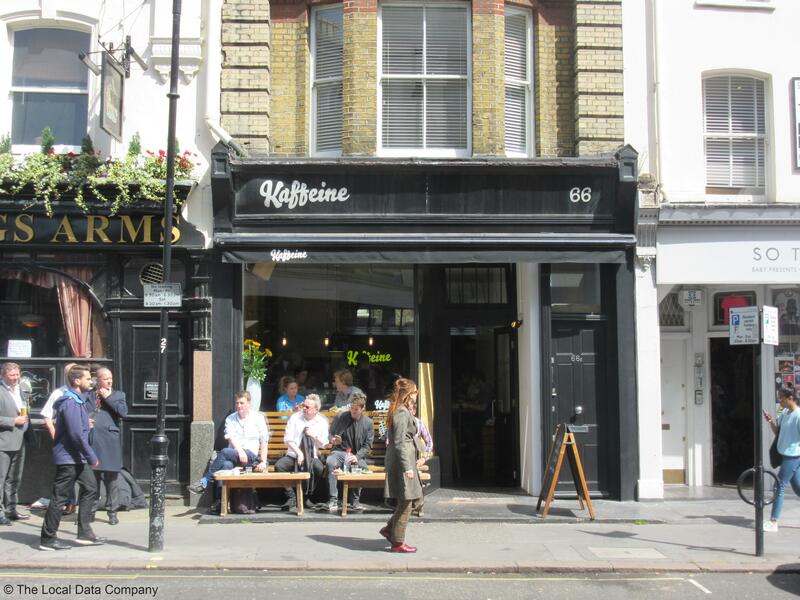 Kaffeine is a business you also might not have heard of. They are an independent retailer with two shops in London, but they are an example of one of the many independents who have expanded in this market and not just grown but thrived. How can they all be profitable? How can they survive when so many are located almost side by side? Where did we buy coffee from before this boom? How can the independents compete and survive with the growth of the chain brands? Are coffee shops the new serviced office for many and certainly for the recruitment industry? Is it Wi-Fi and comfortable seating driving business and not coffee? So, the discussion at Caffe Culture was around these questions and what these operators were all planning to do, especially with such strong financial headwinds with regards to business rates, the living wage, the apprentice levy, Brexit and the squeeze on consumer spend and confidence. The good news is that everyone was confident and had a plan. Overall, there was a feeling of optimising what you have, except for T2 that is still planning on growing. Clearly, there is also a big difference between the big players such as Caffé Nero and Kaffeine. For the smaller operators like Kaffeine and T2 it is about doing what you do in your limited outlets amazingly well, with passionate staff, as well as consistently delivering innovative ideas every day or week that keep the concept alive and make it an experiential and learning location. If you have hundreds of stores then this is almost impossible to achieve, as roll out in terms of messaging, supply chain and marketing takes a long time when perhaps the initiative will only last for a week. That is not to say it is totally impossible as it depends on the business’ strategy and whether allowing local managers to run with local ideas is an option – it could work brilliantly or it could be a disaster! History tells us that most large corporates are slow and cautious rather than fast and furious as often the latter is just not sustainable in the long term. So, having been asked to sit alongside so many industry experts and amazing brands, large and small, I thought it appropriate to arm myself with facts and figures from LDC’s fantastic data insights platform to help inform the discussion. As such, I thought I would share some of these and where I think the market is, and is heading. 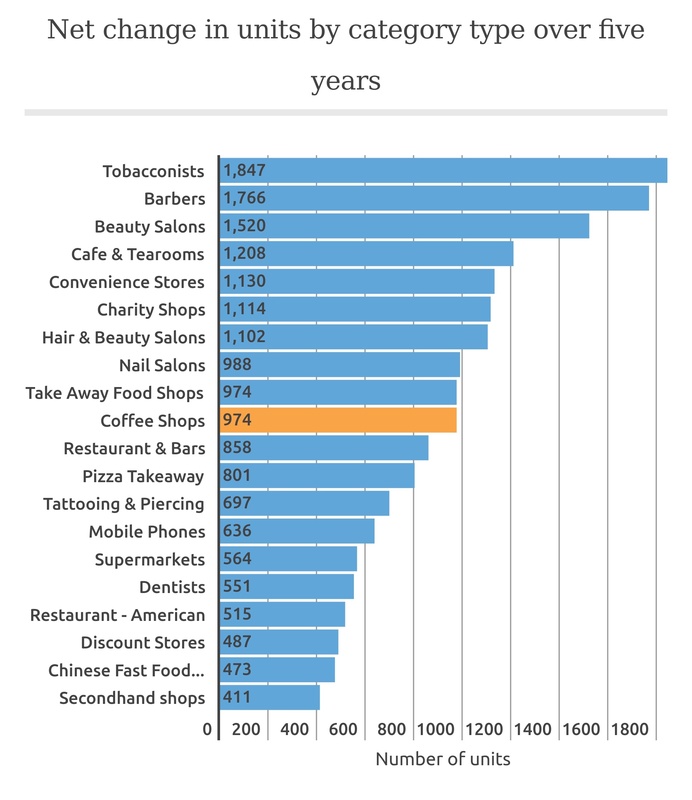 In addition to this, I always believe that CONTEXT is king, so where does the growth of coffee shops sit relative to other shop occupiers? The general view is that coffee shops are the fastest growing shop type that we see on our high streets but in reality, they sit in the middle of the pack with independents (classified as Café & Tearoom and only chains classified as Coffee Shops) growing faster than the chains. On average, the top four coffee shops (Costa, Caffé Nero, Starbucks and Wild Bean Café) have grown at an average of 5% per year and in 2017 this has increased to 6%, so there is no sign of a slowdown by these fasciae but the same is not true of all as figure 3 shows. Analysis of the chains shows that the greatest increase in the last 12 months has happened on Retail Parks which have seen a 15% increase. This reflects the wider changes happening in many sectors where retail parks are increasingly a destination of choice, usually where there are 12+ units to create sufficient footfall to sustain food and beverage units. Retail parks come top again when you look at the top four fasciae but show a significant slowdown from 2015 where the rate was 20%. 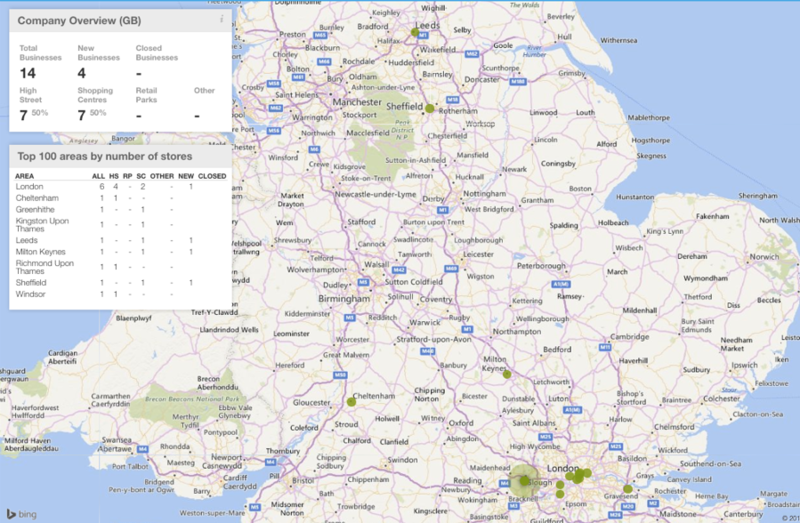 Out of town centres (classified as ‘Other’) have since picked up which relates to the increase in coffee shops at transport hubs including petrol stations. High streets and Shopping Centres have been surprisingly stable which is a result of their greater maturity as locations for coffee shops to traditionally be. Analysis by nation and English region shows Scotland and Wales seeing the greatest increase in the top four fasciae at +13% each. The picture of changes for independents is like that of the chains with the exception that standalone locations/parades are not seeing the same growth. Independent businesses are more about being part of a wider offer and a profile that does not currently sit alongside a few chains such as with petrol forecourts where a strong multiple offer exists or where roadside units have started to appear. By nation and English region then the North East has seen the greatest increase at +6% with Wales close behind at 5%. No sign of a slowdown! As the data shows there are no signs of a slowdown in the number of coffee shops and this is even more significant when you add fast food outlets, bakeries and pubs to the mix who also serve coffee to go! So the British love for coffee continues to grow but the key question will lie around profitability of all outlets as revised business rates, the living wage, the apprentice levy, rising rents in prime locations along with currency devaluation take hold. Experience, service and quality will be key drivers and with so many operators it will be interesting to see how they can all tackle these challenges from the here and now at Kaffeine to ‘coming soon’ for the larger operators. Understanding what is happening at the micro-location level with regards to footfall, spend, competitors, proxies and the number of competing shopping destinations nearby will be critical to success and that’s where LDC helps its clients – your data radar needs to be permanently on and being calibrated for you to achieve the best possible returns. It looks like the sector is performing like a ‘long and strong Americano’ for now anyway. This blog was originally published on MatthewHopkinson.com.